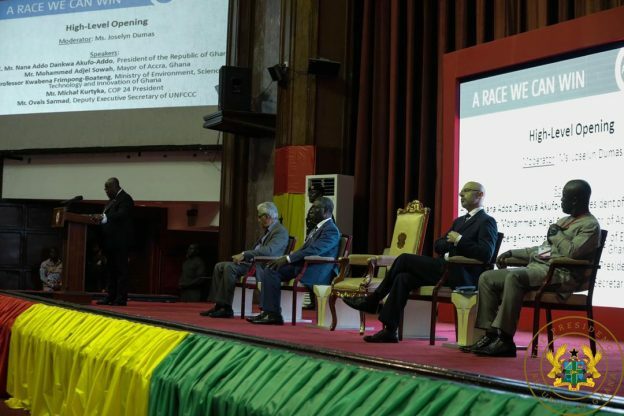 Africa’s Climate Change Week has been opened in Accra with Ghanaian President Nana Addo Dankwa Akufo Addo saying Ghana was committed to fighting climate change challenges. Speaking at the opening ceremony of the High Level Session of the Africa Climate Week on Wednesday in Accra, President Akufo-Addo, contended his Government’s flagship programmes such as the programmes for “Planting for Food and Jobs”, “One-Village-One-Dam”, and “One-District-One-Factory”, are all geared towards boosting industrialization and rural development, as well as building Ghana’s resilience to the impacts on climate change. President Nana Addo noted that he recently announced a major policy boost for distributed renewable energy, also, to deal with climate change as well as ban on felling of rose tree. “Soon, the seat of our nation’s presidency, Jubilee House, will be powered by solar energy. We have placed a ban on illegal mining, the phenomenon we call ‘malmsey’, which was destroying our water bodies, vegetation and our forests. Some twenty thousand (20,000) young people have been engaged to plant more that 10 million trees in two years to create jobs, and restore degraded land,” he added. Though the discourse on Climate Change has different dimensions, the most important aspect of it is that majority of nations across the world have committed to tackling it by reducing the current global temperature to a 2 degrees’ Celsius minimum, well below pre-industrial levels, and pursuing efforts to limit the temperature increase to 1.5 degrees Celsius above pre-industrial levels. Describing climate change as the biggest threat to the realization of the SDGs, President Akufo-Addo noted that it has become an issue of grave concern to most leaders across the world, as it has considerable impact on the fundamentals required for our survival on earth – rise in sea levels, severe and extreme weather conditions, such as droughts, floods and erratic rainfall patterns, and growing desertification.